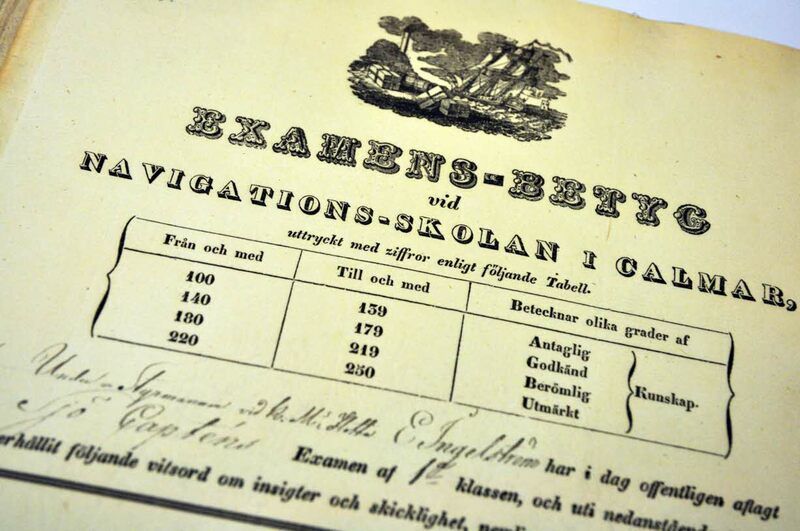 Kalmar Maritime Academy was established on the 1st of October, 1842, with six Second Officer students. We now have about 700 students who will become Master Mariners, Chief Engineers, Operating Technicians, and Engineers. In 1818, Sweden's first paddle steamer, Amphitrite, sailed on Lake Mälaren between the cities of Stockholm, Västerås and Uppsala. That same year, Emanuel Ingelström was born. 23 years later, he began studying to become a Master Mariner at Kalmar Maritime Academy, then called the Navigation School. After a year of study, Emanuel and his five classmates graduated in the very first class at this school. Emanuel, the class valedictorian, had the honor of receiving the very first diploma issued by the school, on the 2nd of May, 1843. We still have the school's copy of that document, as shown in the photo below. In addition to the 700 prospective Master Mariners, Chief Engineers, Operating Technicians, and engineers that we have every year, almost as many students attend courses at Kalmar Maritime Academy. The Master Mariner and Chief Engineer's programs exist as 3 and 4-year programs. In this way, both those with and without at-sea experience can study for their respective certification. Those who already have the required sea-time can study in the 3-year programs while those who do not have the experience can study in the 4-year programs, including 10-12 months of at-sea internship. The programs at Kalmar Maritime Academy are strongly focused on practical skills and training.Students at KMA learn a great deal of theory, while at the same time applying those theories in training practices. KMA has many continually updated simulators for this purpose. The research in the subject maritime science has three directions: working life, organisation and risk management, the environmental impact and marine planning of shipping, and energy efficiency. Read more at the website of the Maritime Science research group. Third-cycle (doctoral) programme in maritime science Curious to do research in the subject of maritime science? We offer opportunities for research for doctoral students.